An incredibly healing and moisturizing blend of oils with full spectrum Omega fats, azulene and carotene! Reduce redness and puffiness, promote cell growth and heal any aberrations in your most delicate areas. A deep orange color, this oil is singularly rich in carotene, vitamin C and a rare source of Omega-7 fatty acid. It has been proven to heal wounds, calm inflammation and deeply nourish skin. The vibrant orange only takes thirty seconds or so to sink into your skin, giving you a sunny glow. If the color of this balm is too much for you, use it as a night creme! Pomegranate seed oil stimulates keratinocytes, which are major cells found in the outer layer of the skin. This helps to reverse skin damage. It is also a great source of Omega-5 fatty acid. Anti-aging, anti-inflammatory, this oil also helps fight free radical damage. Neem oil is anti-bacterial and heals scarring. Borage oil has one of the highest amounts of GLA of any seed oil. Blue Tansy Essential Oil is uniquely high in azulene which gives this oil it’s glorious midnight blue color basically a lullaby for your skin, this oil is highly prized for its calming abilities. Carrot seed essential oil is amazingly high in carotene and Vitamin C.
Neroli essential oil is known for its ability to help promote cell growth and healing properties. Helichrysum essential oil is known as the flower of youth for its abilities to tighten and revitalize skin. Jojoba oil, apricot seed oil, and organic beeswax round out this incredible balm. Please know that the deep rich color of this balm could possibly stain your clothes. 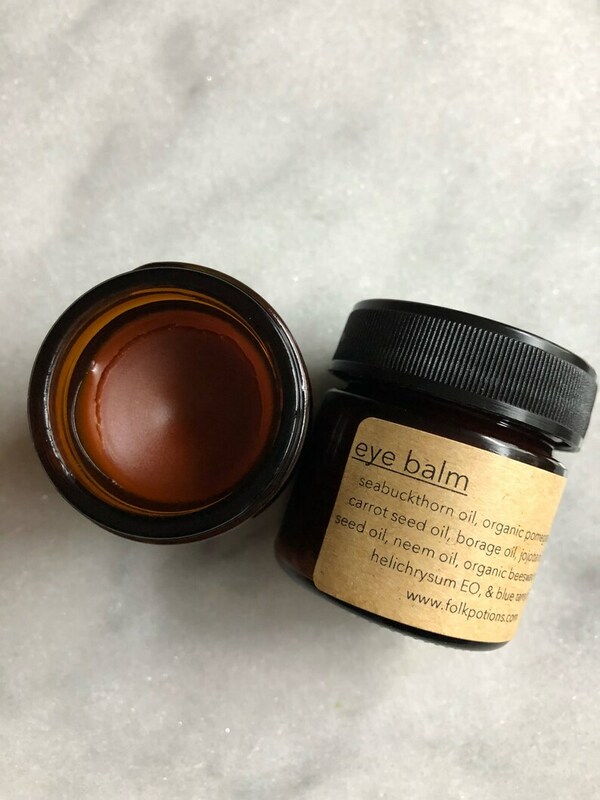 You only need to use a very small amount of this highly concentrated balm, but be sure to wash your hands or rub them together in order to help this oil sink in. love how moisturizing this feels!! This stuff is soooo nourishing. I only use it under my eyes at night, because it takes a bit to sink in, but the orange hue on my eyelids is actually fun during the day. It also freaks my boyfriend out a lot.